We are the owners of Kihei Akahi A-102, a beautiful upscale Townhouse, steps from Kamaole Beach II in the wonderful and affordable Kihei Akahi development in South Maui, the sunniest area of the Island. - Smart TVs can utilize Internet, computer, Netflix, etc. Kihei Akahi consists of 240 units including 8 ocean-front Townhouses. The 8 Townhouses facing the Ocean and in the exclusive 'A' Building, are the absolute best units in the entire Kihei Akahi development. Our unit has 2 walk out lanais (upstairs and main floor) for enhanced outdoor living and to enjoy the spectacular sunsets. At 224 sq. ft. of lanai space, 'A' building Townhouses have considerably more outdoor living space than any of the other 2-bedroom condos at Kihei Akahi which have only 92 sq. ft. of lanai living space. To give you an idea of the Kihei Akahi complex: there are 240 units consisting of 8 2-bedroom Townhouses of 1,175 sq. ft., ten 2-bedroom apartments of 879 sq. ft. and two high-rise concrete buildings with elevators and semi-remote parking. The 2 concrete high-rises consist of 25 studios at 429 sq. ft., 172 1-bedroom units at 655 sq. ft. and 25 2-bedroom units at 932 sq. ft.
As stated, the 8 Townhouses each have 1,175 sq. ft. of indoor living space. The next largest living space is 932 sq. ft. in each of the 25 2-bedroom units in the concrete high rise building. Of major importance to most visitors to Maui is the amount of effective outdoor living space available with their rental unit. As mentioned above, the Townhouses each have 2 lanais with a total area of 224 sq. ft. per Townhouse. Lanais at other 2-bedroom units at Kihei Akahi are only 92 sq. ft. In addition, the Townhouses have a large, well maintained, private, and secure, lawn and garden area strictly for ‘A’ building guests. The large lawn area is like your own private yard for activities from family gatherings to a romantic dinner for two. The size of your lanai is very important to most visitors since that is where you will relax, read, suntan, entertain, have cocktails and meals, watch great sunsets and generally enjoy Maui's wonderful climate all in a private area. You are not in a high-rise area facing another high-rise with all the noise and activities from other condos. The benefits of the eight ‘A’ Building Townhouses in the ‘A’ building are numerous. Our Townhouse has central air conditioning (installed in February, 2016) which covers the entire indoor living space on both floors. There are separate air conditioner remotes for each of the 3 ultra-silent, very efficient units. When the Maui weather is hot and humid (during summer and early autumn), you can be assured of the most peaceful and comfortable existence possible. Our Townhouse has brand new heavy duty Fleetwood Series 1000 sliding glass doors and solid Duo Pane noise cancelling Low E emulsion full height glass panels (to be installed in April, 2017). All door/glass hardware is stainless steel low profile surrounded by an all-aluminum perimeter frame. The configuration on both floors is identical with a full 6-foot unobstructed opening onto the lanai surrounded by a 3-foot wide, 82” high glass panel on each end. At the moment, we are not aware of any other unit at Kihei Akahi with an unobstructed 6-foot opening to the outside lanais. Our Townhouse is fully stocked with dishes, cutlery, furniture, appliances, linens, towels and everything you need for your dream vacation in Paradise. In fact, our refrigerator (MRSP $3,850), is perhaps the largest fridge you have ever experienced. It has 2 side-opening doors with 2 full width separate freezer compartments below. The gas range has 5 burners on the cooktop, a warming oven and a large convection oven. The fridge, range, microwave and dishwasher were all purchased new in 2012. Our Townhouse was totally renovated about 8 years ago during which time we installed solid maple (no MDF) Kraftmaid cabinets in the kitchen and both bathrooms. All cabinets and drawers were refinished in 2016. Kamaole Beach 2, immediately across the road with its fine white sand, has some of the best swimming and snorkeling anywhere. The large crescent shaped, gently sloping fine sand beach with its dunes and tide pool area teem with tropical fish, crabs, starfish, etc. Our Townhouse is located immediately across from Kamaole Beach 2, which, with its ultra-fine white sand and gentle waves/surf, is frequently described as one of the finest beaches on Maui. For your convenience we also include beach towels and folding beach chairs. Kihei Akahi is one of the most popular and requested condominium complexes in Kihei. The grounds are immaculately maintained and the location cannot be beat. Everything you might need for your holiday is all within walking distance. Many visitors do not use a rental car, however, there is so much to do and see on Maui, we always recommend a rental car. Our Kihei beachfront Townhouse is only steps away from one of the most beautiful beaches and also only steps away from the Kihei Akahi private gated pool, BBQ area and tennis court. Whether you are planning a romantic getaway for two, the perfect family vacation, or just need a holiday to unwind, our Townhouse is the perfect destination for you. Front Bedroom – opening onto lanai and facing ocean with full ocean view: Two twin beds with lots of storage, mirror doors, computer desk, FREE long distance to Canada, the US mainland & other Hawaiian Islands plus FREE high-speed wireless Internet, 30” Smart TV, fax machine, telephone, 3 lamps and walkout to lanai with live plants (automatic irrigation), 2 cushion chairs/ottomans & cocktail table. Kitchen/dining area: Fully equipped with refrigerator, stove, oven, microwave, dishwasher, toaster, blender, coffee maker with grinder, juicer, etc. There is an extra wide counter with bar stools facing the living room. All dishes, cutlery, pots, pans and any desired accessories are provided. For rental rates, please click on 'Rates' on the navigation bar. •	Check in time is 3:00 p.m. Check out time is 10:00 a.m.
•	For a deposit refund, less a $250.00 fee, cancellation is required 30 days or more prior to arrival date. •	For cancellation > 60 days, the balance of your payment will be refunded. •	For cancellation < 60 days, payments will be retained unless we are able to re-rent the townhouse in which case a pro-rata refund will be issued. To reserve our Townhouse, please check our Reservation Chart and e-mail us your desired dates. We will contact you within 24 hours and confirm your reservation with a deposit on your credit card. We are Peter & Bev Brill from Calgary, Alberta. Peter graduated from the University of Toronto in 1965 as a Metallurgical Engineer while Bev graduated as a Registered Nurse from Toronto Western Hospital in 1964. We were married in 1965 and have 2 grown children and 4 grand children all living in Alberta, Canada We are both very interested in golf, tennis, hiking, kayaking, cycling, hunting, fishing, traveling and generally anything that keeps us outdoors and active. We spend our winters in Maui, are very proud of our townhouse. We do not hesitate to do the continual upgrades required to maintain our unit as one of the best, if not the best, units at Kihei Akahi. We have the interest, dedication and resources to keep our townhouse perfectly maintained. We also provide free wireless Internet as well as free long distance calling to Canada, the US mainland and the other Hawaiian islands. We purchased our Townhouse in 1977 for the following reasons: 1. Kihei is the sunniest part of Maui. 2. According to locals who we talked to before we made our purchase, Kamaole Beach Park 2, on the ocean immediately across from our unit, was their favorite beach with the finest sand and the gentlest slope. As we were beginning a new family, safety was a prime concern. 3. Kihei Akahi was favorably situated with easy beach access. This was not so for many other condo developments along S. Kihei Rd. 4. Our Townhouse is at the front of the Kihei Akahi development. We look at the ocean, not at other buildings. 5. We have 2 huge lanais (224 sq. ft.) whereas other 2-bedroom units at Kihei Akaki only have 1 small lanai (92 sq. ft.) 6. The 8 Townhouse units in Building 'A' are much larger at 1,175 sq. 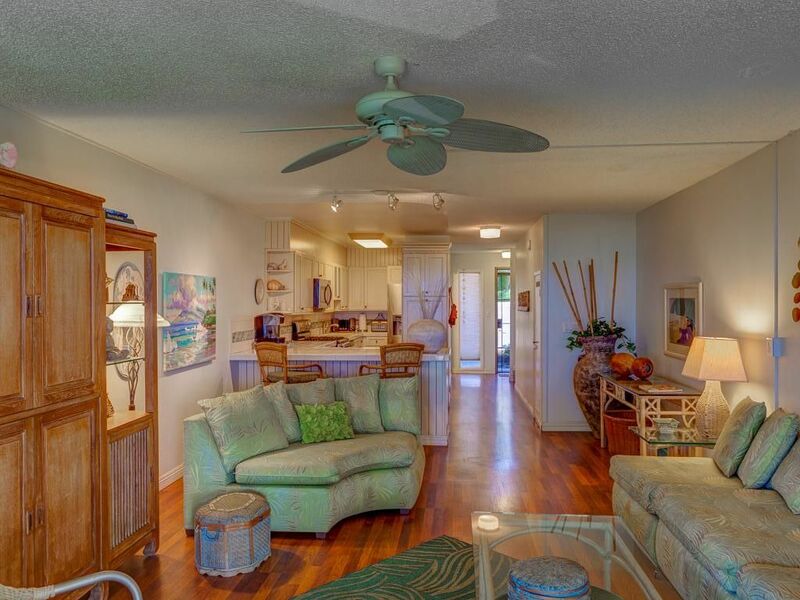 ft. than any of the other 2-bedroom units at Kihei Akahi which have only 835 sq. ft. 7. Kihei Akahi has excellent amenities right at our back door - pools, BBQs, tennis court, office & most importantly parking. We park 4 steps from our back door which makes unloading groceries & other purchases so easy. We don't have to park remote from our unit which would necessitate a long walk or, in most units, excluding the 8 Townhouses, elevators and several trips. We purchased our Townhouse as original owners in 1977 for many of the aforementioned reasons. Maui is so wonderful, especially for Canadians. It has a currency we can easily obtain, the primary language is English, the medical system is excellent, the police protection is very good (although we have never required such assistance), the things to do are endless and the native Hawaiians are marvelous people. Before we decided on Maui, we traveled to many desirable locations such as Martinique, Florida, Tahiti to name a few. We quickly decided that 'Maui no ka oi' (Maui is the best). View from townhouse directly to ocean across 2-lane Rd. Beach is immediately across Rd. about 30 meters from crosswalk. No obstructions to beach view across Rd. Both levels provide great sunset views. Wireless phone system with 3 handsets and a fax machine for ease with your communications needs. Upstairs 15,000 BTU powerful, but quiet, air conditioner. Main floor 12,500 BTU unit new in 2009.
all linens are provided. Most linens are replaced annually. FREE wireless Internet is included. Ours is a fully equiped kitchen including a gas range and with all amenities. If there is something required, we'll get it. We have 2 patio (Lanai) areas, one on each floor with a total of 224 sq ft. All other 2-bedroom units at Kihei Akahi only have 92 sq ft of Lanai space. Our townhouse is ideal for outdoor living facing the ocean and enjoying famous Maui the sunsets. Wheelchair ramps from the parking area directly to the main entrance. There are 2 newly renovated pools for Kihei Akahi guests. The closest pool to our townhouse is closer to the 'A' Building than any other Kihei Akahi units. Parking at back door - 4 steps to entry. No elevators. Two large lanais = 224 sq ft plus large private grassed area. Free wireless Internet as well as free long distance calling to Canada, the US mainland and the other Hawaiian islands. We really liked that the property is in a smaller complex, quiet, with access to swimming pools and tennis court. The condo is centrally located, easy walking distance to restaurants, bars and shopping. The beach is just across the street, our kids loved that we could be on the beach in minutes. Great view of the ocean from the 2nd floor lanai. The interior could use an update - the living room furniture was not comfortable to sit on and the paint needs a little refresh. The kitchen was great, nice large open floor plan, well stocked with kitchen essentials. The kids bedroom did not have adequate hanging closet space or really any drawer space. We made it work, but not great if two couples shared the unit. I had a tough time with the shades in the living room, they are not the easiest to use. Overall, we enjoyed our stay, the unit was nice and clean. I would stay here again. Perfect location right across from a great beach and next to Fred's and Moose McGilacuddy. Lots of food options a short walk away (unfortunately groceries are a drive but there is a general store that has some things close by)Only drawback, as others have noted, is the AC can be a bit unreliable (and not just the timer aspect). But all in all it's a great place to stay. Recommend this condo to a family. Everything we needed was there. It was very nice and just right for our needs. So great to be just across the road to the beach! We loved the condo, one of our granddaughters stayed with us so it was nice to have the extra bedroom. Because it was bigger and we had the outside patio, the other members of the family would hang out there with us. The fridge was so nice, big, had lots of ice. Big kitchen to work in, lots of great counter space. We appreciated the beach chairs, noodles, umbrella, etc. Lots of dishes, cutlery and kitchen utensils of all types. Two things that were missing in the condo that would have been nice to have on hand were cleaning products (to clean the toilet, sink) aluminum foil and saran wrap. We made do and bought some but I thought those items would have been provided. Thanks for everything and for a great stay. We would definitely return and to the same unit if it was available. Awesome property to close the action. We stayed here in June of 2018 for 8 days. The property is well maintained and is in view of a nice beach just across the street. THe back patio and upper bedroom both look out to the beach. The beach is an awesome place for sunset pictures. There are several nice restaurants within walking distance. We SCUBA dive and snorkle, this is 5 minutes from the most popular boat landing where all the Kihei boats puck up divers. There are several awesome beach snorkle and diving location 20 minute drive south. We had a great time here and you will too! Kihei is commonly known as the sunniest area in Maui. It is common to meet Maui vacationers from Kapalua, Napili, Ka'anapali, Lahaina and Ma'alea and other 'northern Maui vacation areas spending time in Kihei/Wailea to avoid the winds and more frequent rain in the north of the Island. Kihei Akahi is located just north of expensive Wailea and offers vacationers the best odds of maximum sunshine and minimum rain (and usually less winds). The normal trade winds on Maui blow from the northeast and frequently the Kihei/Wailea area experiences the best weather on Maui. Kamaole Beach 2 is one of the finest beaches on Maui with fine sand, gradual entry, good snorkeling, ocean swimming, fishing, paddle-boarding, kayaking, everything to provide the best ocean activities on Maui within a few steps. Kamaole Beach 2 is a 'crescent' beach with fine sand and lies between Kamaole Beaches 1 and 3. This is really 'the place to be'! Restaurants and shopping are right next door. Although advisable, and recommended, a car is not necessary. Kihei Akahi has 240 units with 8 deluxe Townhouses (the absolute best units) across the front facing an unobstructed ocean view immediately over South Kihei Rd. There are 2 pools, 2 BBQ areas, tennis and beautiful gardens on the property. Kihei Akahi is about 1/2 mile north of Wailea and our 3 Townhouses offer the best vacation experiences so near to Wailea but at Kihei prices. Maui is a marvellous vacation destination with an unlimited variety of activities. Hiking is world class, restaurants are world class and Wailea is about 1/2 mile down South Kihei Road. Golf, tennis, swimming - you name it - it is within a reasonable distance. Almost any activity that you could imagine is available nearby. Each of our 3 Townhouses in Kihei Akahi are unquestionably the best units in Kihei Akahi. They each have 1,175 sq. ft. of indoor living space, two large exterior decks (lanais) totalling an additional 224 sq. ft. They are the largest units in Kihei Akahi by both indoor and outdoor living space. All 3 of our Townhouses have Fujitsu central air conditioning which is a rarity, indeed, in the Kihei area. Each of the 2 upstairs bedrooms and the downstairs living area have separate air conditioning units with their own respective controls. There is a private lawn fronting the 8 townhouses with an unobstructed view across South Kihei Road directly to Kamaole Beach 2 and the ocean. Private parking is right behind each Townhouse eliminating elevators and long treks with your groceries and shopping treasures. You will definitely appreciate this benefit. The South Maui Coastal Walk is wonderful for your daily walk/jog and runs for several miles along the ocean coast from the Polo Beach Club in Wailea, past the world class Wailea Hotels, through the Kamaole beaches in Kihei up to Kalama Park in central Kihei and beyond. We are very proud of our 3 Townhouses and will continue to provide the very best units possible. Our reputation is extremely important to us and we intend to do everything possible to maintain our top reputation. We appreciate your taking the time to view our Website and, if you have any questions whatsoever, please contact us directly. Cancellation Policy •	For a deposit refund, less a $250.00 fee, cancellation is required 30 days or more prior to arrival date. •	For cancellation > 60 days, the balance of your payment will be refunded. •	For cancellation < 60 days, payments will be retained unless we are able to re-rent the townhouse in which case a pro-rata refund will be issued.